REBERBAR is a pub not far from the Olimpiyskiy stadium, in the centre of Kiev. Designed on a total area of 350 square meters on two floors for 150 seating places, its interior design and brand identity have been entirely realized by the designers Aleksandr and Vladimir Yudin of the Ukrainian studio YUDIN Design. With ribs and beer as main ideas, the designers created also the name of the pub and the logo that represents graphic ribs set between the letters of the name. Aimed primarily at beer and meat lovers, this pub has been designed in a minimalist style along with a brutal bar area. Recently visited by the leader of the famous rock band Rammstein, Till Lindemann, the pub REBERBAR often hosts Ukrainian rock bands for live concerts. The interiors of this place have been decorated more in yellow, which symbolizes the beer, and white, for ribs, on a grey background. 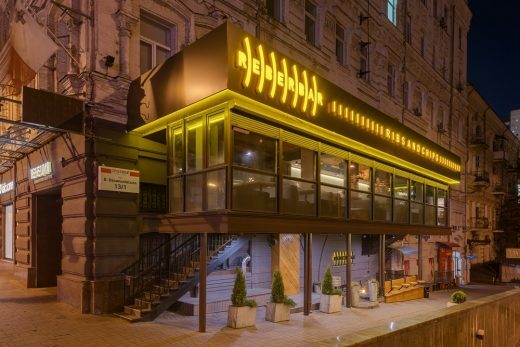 The second floor of REBERBAR is a summer terrace, with a beautiful view of Kiev’s metropolitan life, which becomes even more exciting in the evening.